Andrew and I got in on the most recent Kickstarter by Trenchworx, “Tanks on the Western Front“. Andrew ordered a Jagdtiger, Jagdpanther and a Marder III, which he’ll review when he gets them assembled. 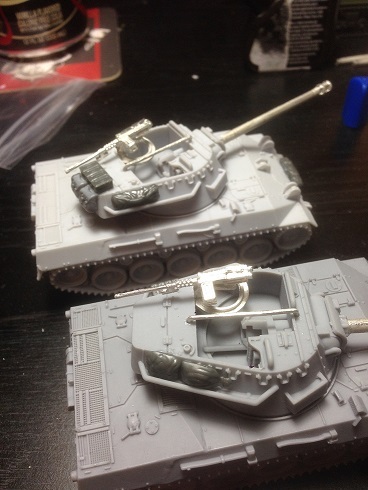 I had the pleasure of putting together the pair of M18 Hellcats I had ordered and I’ve got to say, these were some of the best resin kits I’ve ever worked with. As is normal for many resin tank kits, the body of the tank was a three piece assembly: the two tracks and the main hull. For the most part, the model was very smooth and didn’t require a lot of cleaning. The metal bits required a bit (the barrel and machine gun), but on the resin the only cleaning required on visible areas was on the interior of the tracks as shown below. It was necessary to get between the wheels to clear out some resin flash that was in there. Additionally I spent some time filing off the bumps on either side in order to ensure a flush fit with the hull. As seen in the picture below, Trenchworx also added a connection point in the hull and on the track (the rectangular protrusion) so that it would have a stronger bond to the hull after being glued on when the connector was inserted into the hull gap. Trenchworx also added something I’ve never seen in a resin tank before (at least not by default as part of the kit, plenty of people have done it on their own). 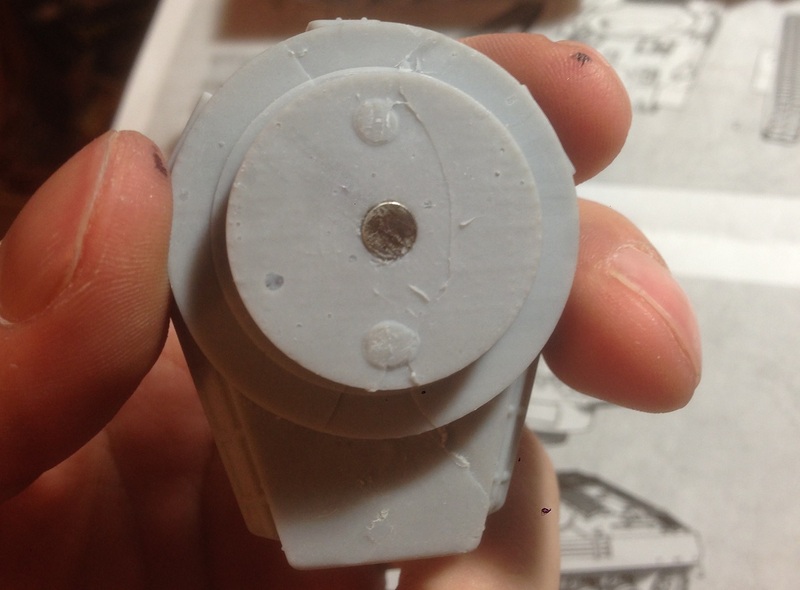 They included a pair of small magnets in the kit and have slots for them in the base of the turret and in the turret ring of the hull, so that when the turret is placed on the tank it won’t just pop off mid-gaming if you pick the tank up. The magnets aren’t strong enough to reliably pick the tank up by the turret, but it holds them in quite well during normal use. The turret was a four piece assembly, with the gun barrel (of which you have 2 options, one with a muzzle brake and one without), a pintle-ring for the machine gun mount, the .50 cal MG itself, and then a small bar running across the top of the open turret (possibly intended as a handhold, although I’m not sure to be honest). 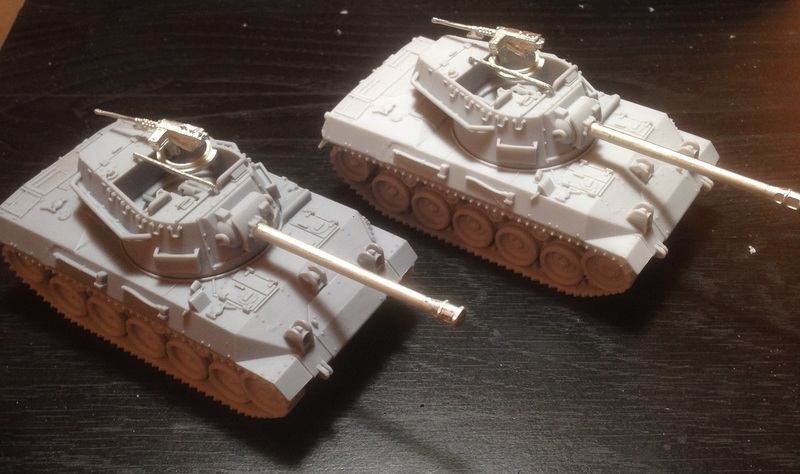 Unfortunately Trenchworx doesn’t include a crew in their kit, so I’ll be mixing in crew members from the M10 Wolverine kits I have from Warlord as well as crew from the M18 plastic Hellcat kits that Warlord just released (I have two on the way). And of course, no tank is complete without adding on some stowage to add a little bit of uniqueness. I did this using a mixture of the Rubicon Allied Stowage kit and some backpacks from the Warlord US Airborne. Overall these kits were fantastic. I personally tend to be a bit hesitant with resin tanks as I’ve had some bad experiences with bubbling, poor quality casts, or kits requiring a lot of work to make pieces fit flush. These Hellcats managed to avoid every fear I had. The only thing that I was disappointed in with them was the lack of crew. The Kickstarter for them only recently ended so these aren’t available on the Trenchworx webstore yet, but I imagine they will be in the not-too-distant future. I’ll be waiting to paint them up until I have the Warlord plastic kits in hand, so that I can figure out my crew situation as well as doing a side-by-side comparison. Once they’re painted up I’ll add photos to the end of this post. Nice review! What other kits do they have available?